Situated in the heart at downtown Seattle. We offer a deluxe continental breakfast featuring mouth watering cinnamon rolls, danishes, yogurts and cereal. Every room has free wireless internet and we offer a 24 hour fitness center. 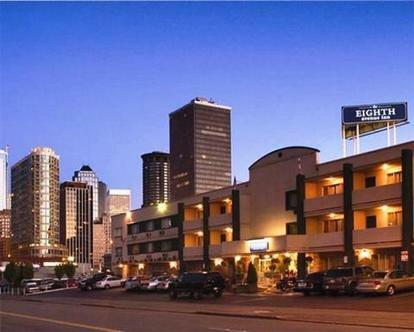 This hotel is located less than a mile from the Washington State Convention and Trade Center in the heart of downtown Seattle. The hotel is only six blocks away from the Space Needle. The Eighth Avenue Inn is a 100 percent non smoking hotel and is only two blocks from the free bus zone.